Seattle’s A Sense of Gravity has been noodling around with their evolving style of prog metal for a few years now, first releasing an EP in 2011 to find their feet before appearing on a most unlikely compilation album of Djent inspired Christmas tunes. Fast forward to 2014 and the style-surfing six piece has released their long-in-the-making debut Travail, and while the wait may have been an extended one, the group’s first outing is proof positive that first impressions are well worth spending a little extra time on. 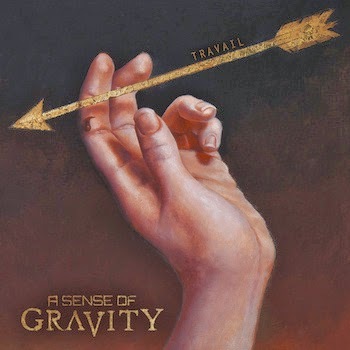 A Sense of Gravity’s first record is a well crafted and expansive conglomeration of progressive hard rock, heavy metal, and jazz fusion that has a guaranteed shelf life of many, many spins on the player. As mentioned, the real strength of Travail lies in its seamless marriage of the various styles and influences that constitute the band’s sound. With just the first track, “Wraith”, the listener is greeted with a grand choral introduction only to be instantly assaulted with an effectively vicious and punchy brand of death-djent, which itself opens itself to a clean chorus more reminiscent of traditional prog metal. It’s a great sound in its execution and would make for an easy formula to fall into for an entire album, but thankfully the group keeps things mostly fresh for the long-haul. Other songs like the following “Stormborn” and “Answers Lost” share in the same vein of composition, though in their own respective fashions, while others such as “Trichotillomania” and “Weaving Memories” travel wholly into their own dimensions of jazz fusion wanderings and progressive experimentation. These variances in approach and delivery not only help keep a sense of variety and freshness alive throughout the listen, but they also work well at creating a good flow to the album’s line-up. At almost no point during a single spin does Travail sound tired or repetitive, due to the band keeping the music in constant motion through evolving styles, tempos, and sonic palettes without giving a hint of any copy and paste shortcuts. Songwriting mechanic aside, A Sense of Gravity’s debut also sounds good as a finished product, especially for a first effort from an unsigned and self-produced local outfit. The album is punchy and clear, with the mix remaining pleasantly articulate even throughout the more sonically burdensome moments of the heavier songs. The mastering of the record was even given an excellent handling by none other than Jens Bogren at his Fascination Street Studios, though the result thankfully does not seem to suffer from the washed out hyper-polishing he seems to prefer nowadays (think Dark Tranquility albums of recent years). For a debut long in the making, A Sense of Gravity has delivered a very commendable and listenable record that stretches stylistically to either end of the progressive metal spectrum; from the heavier leanings of modern bands such as Periphery or Between the Buried and Me, to the lighter jazz-influenced stylings of more traditional bands like Dream Theater and even some spiritual reminiscences of King Crimson. While there may not be anything on the record that truly attempts to reinvent any wheels, the bottom line is that Travail does a fantastic job of sewing together many different stylistic threads into a well woven tapestry of prog metal music. For modern fans of the genre, this is a must listen and this Seattle band will surely be one to watch out for on the world stage in the years to come.